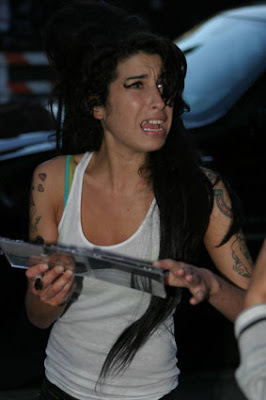 Amy Winehouse was forced to have her trademark beehive hairstyle searched for drugs on a visit to her imprisoned husband Blake Fielder-Civil. The Rehab star was granted permission to see Fielder-Civil at London's Pentonville Prison on Wednesday, prior to the start of her U.K. tour in Birmingham later that evening - a gig which she later dedicated to her incarcerated beau. Prison officers made Winehouse undo her beehive, before making her run her fingers through it to prove nothing was contained in the over sized hairdo. Fielder-Civil was jailed last week accused of actuating grievous bodily harm (GBH) and attempting to pervert the course of justice."